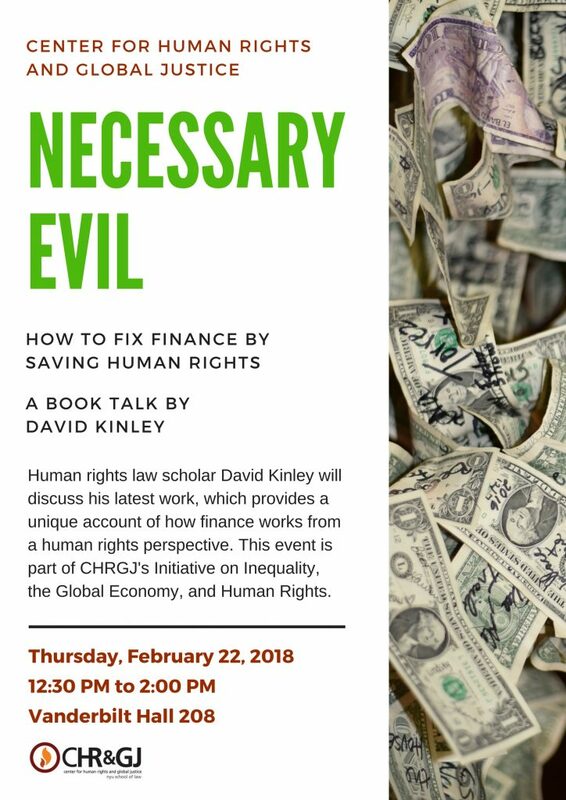 Professor David Kinley discusses his latest book, Necessary Evil: How to Fix Finance by Saving Human Rights. This event is open to the public. Please bring a photo ID to access the building. Professor David Kinley holds the Chair in Human Rights Law at the University of Sydney Law School. He is also an Academic Panel member of Doughty Street Chambers in London, a member of the Australian Council for Human Rights, and was a founding member of Australian Lawyers for Human Rights. He is currently on the Faculty of Oxford/George Washington Universities’ International Human Rights Law Summer School and has previously held teaching positions at Cambridge University, ANU, University of New South Wales, Washington College of Law, American University, and Paris 1 (La Sorbonne). Learn more about his latest book.